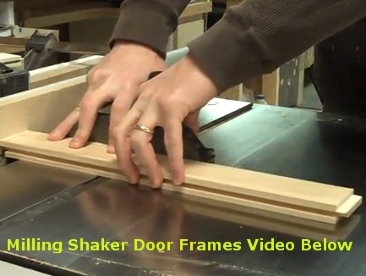 The image demonstrates a mill man making shaker style cabinet door frames. As you can see the groove is already cut in the stock and he is now making the tenon cuts on the ends of the stile pieces. It’s important to note that the grove you are looking at here was not made with the table saw dado blade set. When you are preparing the door frames for assembly, the groove must be cut using a router assembly that has a dato router bit set up.